Indian born Deepak Chopra has earned fame as a great physician in the field of alternative medicine in the US. Dr. Chopra serves as the Director of Education at the Chopra Center, which offers training programs in mind body medicine. He has established a new life giving pattern which has a crucial connection between mind, body, spirit and healing. Chopra is also known as the prolific author of more than 35 books, 100 audio, video and CD-ROM titles, which have been translated into 35 languages with over 20 million copies sold worldwide. Born in Delhi, India in the year 1947, Chopra was raised in a family infused with both Western Medicine and Traditional Hindu beliefs and practices. His father, Krishnan Chopra was a prominent cardiologist who served as the dean of a local hospital and a lieutenant in the British army and his grandfather was an Ayurveda ( Indian Medicine) practitioner. Following his father's career in medicine, Chopra graduated from the All India Institute of Medical Science in 1968. He went to United States in 1970 to serve an internship at a hospital in New Jersey. He got further training at the Lahey Clinic and University of Virginia Hospital. In the early 1980s, he became the Chief of staff at New England Memorial Hospital and later the Chief at Boston Regional Medical Center and he also taught at Tufts University and Boston University Schools of Medicine. Meanwhile Dr. Chopra built a successful endocrinology practice in Boston. In 1981, a turning point occurred in Chopra's life when he met Dr. Brihaspati Dev Triguna, a famous Ayurvedic physician at New Delhi, who advised him to meditate. At first, he didn't give it much thought but eventually he was impressed by the sizable amount of research that proves that Transcendental Meditation (TM) reduces stress. In the late 1980s and early 1990s, Chopra became a dedicated champion of TM thought and practice. In 1985 he met Maharishi Mahesh Yogi, who invited Chopra to study Ayurveda. That year Chopra became the president of the American Association for Ayurvedic Medicine. He was later named medical director of the Maharishi Ayurveda Health Center for Stress Management and Behavioral Medicine. In 1991, the Journal of the American Medical Association published an article by Chopra, Triguna and Hari Sharma, "Letter From New Delhi: Maharishi Ayur-Veda: Modern Insights Into Ancient Medicine." which faced a lot of criticism regarding the Hindu belief in yogic flying, and the basis of Chopra's Ayurveda in Transcendental Meditation. In 1992, he served on the National Institutes of Health Ad Hoc Panel on Alternative Medicine. He Published his famous work, 'Ageless Body, Timeless Mind: The Quantum Alternative to Growing Old' in 1993, which sold 130,000 copies in one day. In the same year, Chopra and family moved to La Jolla, California. He soon became the executive director of the Sharp Institute for Human Potential and Mind–Body Medicine with a $30,000 grant from the Office of Alternative Medicine in the National Institutes to study Ayurvedic medicine. His vision to establish a medical system based upon the premise that health is a lively state of balance and integration of body, mind, and spirit led him to open the Chopra Centre for well being in California in 1995. Through this Center, Chopra is trying to expand his healing approach using the integration of the best of western medicine with natural healing traditions. The University of California, San Diego School of Medicine has granted continuing medical education credits for this program, which satisfies requirements for the American Medical Association Physician's Recognition Award. With charismatic presentation and astute marketing, Chopra has made the ancient sciences of Ayurveda, yoga and meditation user-friendly to the American mainstream. 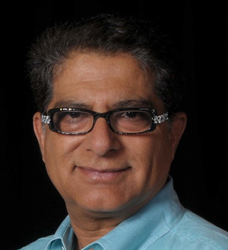 Deepak Chopra's popularity as an international presenter and keynote speaker is exemplified in an impressive list of honorariums. Esquire Magazine designated him as one of the top ten motivational speakers in the country; and in 1995, he received the Toastmasters International Top Five Outstanding Speakers award, earlier received by President Nelson Mandela, Congresswoman Barbara Jordan, Tom Peters and Garrison Keillor . He is the recipient of the Einstein Award through Albert Einstein College of Medicine in collaboration with the American Journal of Psychotherapy. Chopra married wife Rita more than thirty years ago when he was just finishing medical school. Rita is now supervising the staff at the Chopra center for Well Being in La Jolla. They live in San Diego and have two kids, Gautam and Mallika . Mallika and son - in- law Sumant are both students in business school at Kellogg while son Gautam host Talk shows in Channel 1 TV.